Hi again from the Left of Center design team! Welcome to challenge number 63 sponsored by Bugaboo with the theme "Cool Kids". My cool kid image is being used for a storage container for that special cool kid of yours! 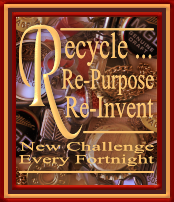 The container is recycled (Yeah) a oatmeal canister covered with dark green card stock. I didn't smooth my glue on the paper or container..took the short cut and just dribbled and strung it along. After drying my first thought was oh NO! But as in most crafting mishaps, I turned it into a positive by inking the paper with Distress Inks, Evergreen Bough and Mahogany, and they ended up highlighting those bumpy places fabulously:) Then I used the Cricut cartridge " " for the fence and the sentiment. I cut them from a brown kraft paper color and inked the grass with the green Distress Ink and the edges with the other and some black ink. The cute image is colored with Bic Mark Its and a gold Sharpie, fussy cut, glued to brown card stock, fussy cut again, Glossy Accents on the moon the skull hanging, and details on the girl. I put two of my pink glow in the dark almost melted right beads (lol!) on where the skull hangs down for a touch of dimension to it. So from almost mistake to end, I love my cool kid...she now holds my part of my bead stash on my desk. So come on and play with us! Happy Crafting and have fun!! AWESOME! 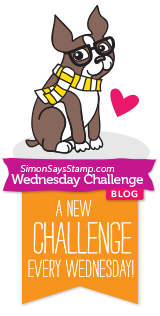 Thanks so much for playing Simon Says Stamp Wednesday “Anything Goes” Challenge! This is so awesome, love the idea and the creepy black eyes, :D. Thank you for joining Sassy Studio Designs, good luck. Love the storage container and image is just purrfect for A Step in the Dark!!! Good Luck!! !